Maybe if you're a die caster you get free passage? To be more exact it means something like "sitting on the die cast is free of charge"
@Ashleigh: The mistake was made long before Google translate was involved. "Ride Hard and Die Free"? Swedish and English are similar enough languages that things translate very well between the two, but the phrase is idiomatic enough that it would be an extremely awkward translation, at best, to most other languages. 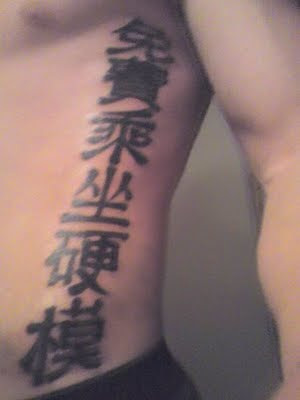 So many of the bad tattoo translations featured on this site started with highly idiomatic or slang expressions that would be completely untranslatable - the lack of thought put into the tattoos becomes pretty obvious from the first step. When will people learn that you can't translate thins word for word in another language and expect it to mean the same thing.